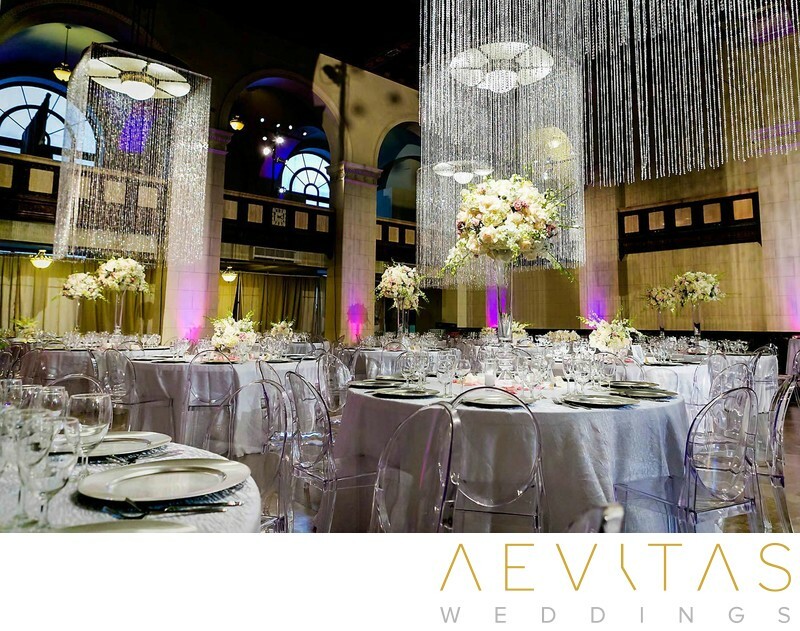 Converted from an old bank into one of Los Angeles most impressive historic wedding venues, Majestic Halls oozes vintage elegance and old world charm. Its ornate interior decor includes 32-foot high ceilings, adorned in frescoes, and rich bronze ornamentation that exudes luxury. Wedding ceremonies are held in the North Hall, with commanding marble pillars surrounding the marble-floor aisle and the capacity to host up to 330 guests. The lavish detailing of this architectural masterpiece fits with a classic, Art Deco style wedding, with the opportunity to add in your own florals and lighting to enrich the space. Receptions can be held in the South Hall, with its ornate wood paneling, deep burgundy marble banisters and stunning chandeliers creating a distinctly glamorous setting. A spectacular marble staircase leads to the mezzanine floor, offering outstanding views back across the reception hall and providing a grand entrance for the couple. The South Hall can host up to 600 guests, with its bank vault aperture a constant reminder of the building’s historic significance. For couples looking for a more modern space, Majestic Halls also offers The Catwalk - a multi-tiered, industrial-style venue that has a distinctly different edge. All catering and beverage packages are provided on-site by the event team at Majestic Halls, with menus customized to the couple’s wishes and the option to use outside catering if you prefer. There is flexibility to decorate the spaces to your individual desires, and ongoing support to create a dream wedding day you will never forget. The location of Majestic Halls within the heart of Downtown Los Angeles allows couples to schedule in a wedding day couple portrait session with the iconic cityscape as a backdrop. Buildings such as the Walt Disney Concert Hall and MOCA provide dramatic urban architecture to work with, all within a short distance of the Majestic Halls venue.